Victor Oladipo isn't leaving the gym until he's satisfied with his shooting. The common criticism against the Orlando Magic's dynamic young backcourt is a simple one: They can't shoot. Elfrid Payton and Victor Oladipo are amazingly talented prospects, but their inability to consistently knock down shots from the perimeter is limiting just how good they can be. 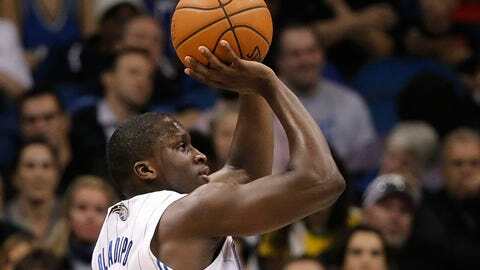 Even just a little bit of improvement by Oladipo from deep could drastically help Orlando. He's not a horrific 3-point shooter; last year, he made just shy of 34 percent of his looks from downtown. The breakeven point for a 3-point shooter is roughly 36 percent. At that point, defenses at least have to consider covering Oladipo, which prevents defenders from sagging into the lane and preventing the Magic from driving to the rim. But with this kind of dedication, the sky could be the limit for Oladipo as a shooter. And that, in turn, could help him take the next step in his path toward stardom. Oladipo had already gone through a two-hour practice and another 60 minutes of drills working to perfect his decision-making in pick-and-roll sets and his shooting off dribble-handoff plays. Then came the outside shooting session where Oladipo had to make at least eight of 10 tries from five different spots around the 3-point stripe. But Oladipo pushed on. And by the fifth time around the arc he made nine of 10 3-point shots – an impressive feat even with no defenders around him. There was no way, Oladipo stressed, that he was leaving the gym without hitting the goal for the shooting session. Even if it would have taken him all night.